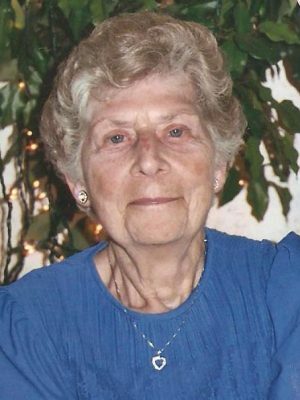 FULTON, NY – Betty Waldron Cooper, 96, of Fulton, passed away peacefully on Tuesday, September 25, 2018. She was predeceased by her husband, Howard “Huddy;” a son, Howard “Spencer;” and by her daughter, Patricia. She is survived by her sons, Thomas (Nancy) of Richmond, Va., Jack (Mary) of Fulton, Russell (Debbie) of Oswego, Ronald (Doris) of Fulton, Richard of Wolcott and Robin (Jennifer) of Inverness, Fla.; 13 grandchildren; 20 great-grandchildren; several nieces and nephews and many, many friends. A memorial service will be held at 2 p.m., Sunday, September 30, at Brown Funeral Home, 21 Flood Drive, Fulton, with burial to follow in Mount Adnah Cemetery. In lieu of flowers, contributions in her name may be donated to the Mount Adnah Cemetery Preservation Fund, P.O. Box 715, Fulton, NY 13069.